An old scrapbook found in a San Francisco dumpster, an enigmatic pyramid that presides over a small town in Washington State, and a story too implausible to have been fabricated. 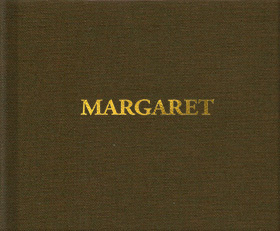 Jason Webleypresents "Margaret", a full length album and hardcover book based on the life and writings of Margaret Rucker, a poet whose tragic serendipitous story was rescued from the bottom of a garbage bin. Featuring new music by Jason Webley, Eliza Rickman, Jherek Bischoff, Led to Sea, Shenandoah Davis, Lonesome Leash, Zac Pennington, and Mts. & Tunnels, and writings by Jason Webley and Chicken John Rinaldi. There's no such thing as garbage. (C)2014 by the individual artists.